My best friend Erin came to visit me for a week. I thought it would be the perfect time to throw a summer crab fest to welcome Erin (back) to Arizona and also to celebrate with a few of my AZ girlfriends. It took about three months to plan my party and it ends up that finding crab fest-themed decor and party supplies is no small feat. I could have taken the easy road and bought some inflatable crab bowls and some some plastic lobster claws, but I had an image in my head and plastic inflatable crab bowls it was not. I decided to channel my event planner creativity and I came up with some fun ideas. Clockwork from the top: 1. I served everything on white platters. I think that all food looks the most appetizing on a white background and white is totally a summer color. 2. I made my invitations using aqua colored blank cards from Michael’s. The front is aqua and has a circular window to the inside of the card. I used the aqua and red color scheme for the invitation copy. The sparkly crab is made out of red cardstock and glitter, which I thought gave the invitation a little punch of glam. 3. I served water with mint (in a Crate and Barrel pitcher) and vodka thyme lemonade (in a five-way cake plate/punch bowl from Home Goods). I’ll post the lemonade recipe soon. 4. I placed the seafood crackers on this aqua colored fish plate I found at Marshall’s for about $7. 5. Two days before the crab fest I found these red and aqua crab-print napkins at Target. What luck! 6. I used this Martha Stewart crab punch to make the crabs on the invitations. I also used it to make a border on the craft paper I used to cover the kitchen table. 7. This is Martha Stewart’s Patriotic Berry Trifle. I’ll share this recipe soon, too. I picked up a smaller sized trifle bowl at Sur la Table for $14. 8. I also found these paper lanterns at Target along with the crab napkins. They came in packs of two – one with a crab and one with an anchor. I used thick giftwrap ribbon to hang them inside a large deep-set window next to the kitchen table. 9. Center photo: I covered the table in a red paper table cloth from Party City. I laid a length of brown craft paper down the center, and the crab punchouts turned into red crabs dancing along the tabletop. I used my white dinner plates (you’ll see these a lot on my blog) and the gorgeous wine glasses that my mother-in-law handed down to me last month. Crab cups from Target and the seafood utensil set from Sur la Table ($19.99 for ramekins and seafood picks for four and two seafood crackers) completed my crabby tablescape. In case you’re wondering, my menu was: buffalo chicken dip and chips with salsa and guacamole for the appetizers, king crab legs, vegetable rotini and feta salad, spinach and strawberry salad with homemade dressing, chicken quesadilla for dinner and patriotic berry trifle for dessert. 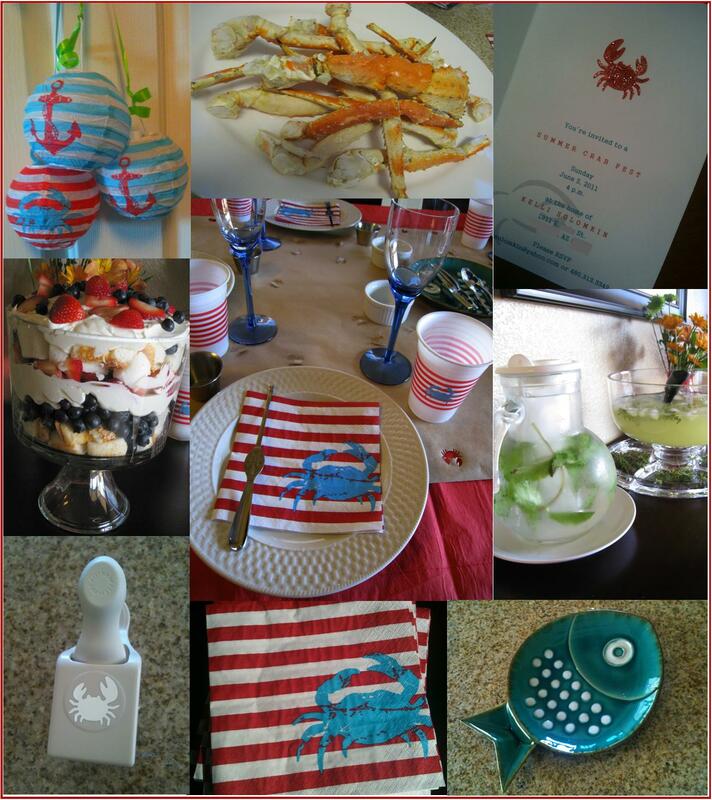 My crab fest was a success and it was a great way to kick off Erin’s visit and to welcome the summer. This entry was posted in Dinner, Seafood, Summer, Theme, Uncategorized and tagged Crab, Dinner, Food, Recipes, seafood, summer, theme. Bookmark the permalink. Please send me the buffalo chicken dip recipe and thyme vodka lemonade recipe. Thanks m’dear! It was a great party! The blog looks so cute so far! And the party was great, I miss you! !